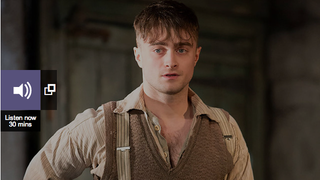 Daniel Radcliffe discusses playing the title role of Billy in the darkly comic stage play The Cripple of Inishmaan by Martin McDonagh (writer and director of In Bruges). Radcliffe describes the challenges of taking on a distinct west coast Irish accent and portraying someone with severe disabilities, who wants to leave his remote island home when a Hollywood film crew comes to town. The actor also talks about his career choices post-Harry Potter and a potential return to his famous role, why he expects people to dislike him, and whether he would want to take the lead in Doctor Who. Adapted from Max Brooks' novel with the same name, World War Z is the latest zombie apocalypse film. It stars Brad Pitt as Gerry Lane, a United Nations investigator who travels the world to try work out a cure for the zombie pandemic. Jenny McCartney gives her verdict. Neil Gaiman, whose books include Stardust and Coraline, chooses a work by the Victorian artist Richard Dadd - The Fairy Feller's Master-Stroke* - painted whilst Dadd was incarcerated at Bedlam hospital.